Idaho Falls, ID – The South Mink Fire started yesterday afternoon in the Mink Creek drainage south of Pocatello, ID, and has burned 12 acres on the Caribou-Targhee National Forest. The cause of the fire is still under investigation. Firefighters anticipate having the fire contained later this afternoon. 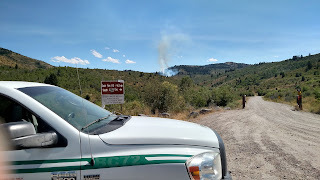 Containment indicates that firefighters have made their way around the entire fire and do not anticipate any further growth outside of the fire perimeter. Firefighters are using Crystal Summit as a base location for camp and supply deliveries. Travelers on the Bannock Highway should expect an increase in traffic. A road closure is also in place for public and firefighter safety. South Fork Mink Creek Road (Forest Road 163) is closed from the junction of the Bannock Highway (South Mink Creek Road) to the Forest boundary. This closure will likely remain in place until the fire is out. Fire danger is at Very High across Eastern Idaho. In 2016, the East Idaho Interagency Fire Center (EIIFC) has responded to 36 fires that have burned a total of 2,406 acres. While those statistics are below average for eastern Idaho, only four of the 36 fires were caused by lightning. Residents and visitors must be vigilant to prevent wildfires. One less spark means one less Idaho wildfire.